Bray Wanderers moved up to sixth in the Airtricity Premier Division as they claimed victory over UCD in the UCD Bowl on Friday night. Sean Houston headed the Seagulls into the lead in just the second minute in a frantic start. Students captain Michael Leahy put his side back into the game in the second half but they never looked like finding an equaliser as Bray returned to form after two heavy defeats last week. Chris Shields doubled the lead mid-way through the half as he deflected the ball past Ger Barron in a crowded UCD penalty area. Sean Harding replaced Sean Russell in UCD's only change from their 4-3 win over Galway United. Danny O'Connor and Dane Massey and Dean Zambra dropped out of the Bray team, with Sean Houston Dan McGuinness and Jake Kelly coming in. Bray started brightly and quickly moved into the lead. McGuinness was fouled by Nangle on the right, with Gary Dempsey crossing from the free for Houston to head home from eight yards. The Seagulls were enjoying the opening stages and very much on top. Dempsey was strongly involved in a flowing move that saw McGuinness curl a shot wide from distance. UCD's only threat in the first 20 minutes were from set pieces, with Houston doing well to clear a Marshall free as the game lost a small bit of intensity after the frantic early period. The home side made a change in the 23rd minute as Samir Belhout replaced Robbie Benson but their challenge was made all the harder just 60 seconds later. Jake Kelly's weak shot from outside the penalty area deflected off Chris Shields in a crowded box and rebounded into the corner of the net. UCD offered little in their efforts to get back into the game. Darren Meenan was unable to get to Paul O'Conor cross in a rare attack, with Martin Russell's team looking short of ideas in the final third, even with Belhout's presence. Michael Corry did well to shake off another venture forward from Houston, holding off the Bray left-back and managing to clear the ball before Wanderers could try to win it back. Bray were happy to try to pick the Students off on the break and invited some pressure on their own defence. Graham Rusk's quick turn and cross forced Matt Gregg into claiming the ball in the 35th minute and then Belhout let the ball get stuck under his feet when well-placed in the penalty area. The half finished with Derek Prendergast clearing a Dean Marshall cross from a free as Bray went into the break with a two-goal advantage and looking comfortable. Houston had to be alert to stop Belhout getting an effort in on goal on 53 minutes with the second half beginning in quite an even fashion. But a superb delivery from Paul Corry helped the Students get back into the game three minutes later. Corry flighted a free-kick towards the Bray goal and it was headed into the net from close-in by College captain Michael Leahy. Bray brought on Dean Zambra for Jake Kelly and then John Mulroy for Dan McGuinness to try to impose themselves on the game once again. Belhout was looking dangerous and his runs across the Wanderers' defence were causing plenty of problems. Mulroy missed a great chance in the 72nd minute when he headed wide from a Gary Dempsey corner. Chances were rare in the second half with UCD still looking a big threat from aerial balls as Prendergast had to be alert to win a battle with Prendergast from Corry's set-piece. The closing stages were very scrappy and in the end Bray saw the game out comfortably to overcome the heavy defeats to Dundalk and Sligo Rovers in the previous week. Stuart Purcell, Fine Art Valuer was in with Declan today. Padraig Gallagher, Political Correspondent, Newstalk Network News, on Avril Doyle pulling out of the race for the Fine Geal presidential nomination and Denis Naughten been thrown outof the Fine Gael parlimentary party. Producer Claire Darmody had a run through of the stories in the papers today. 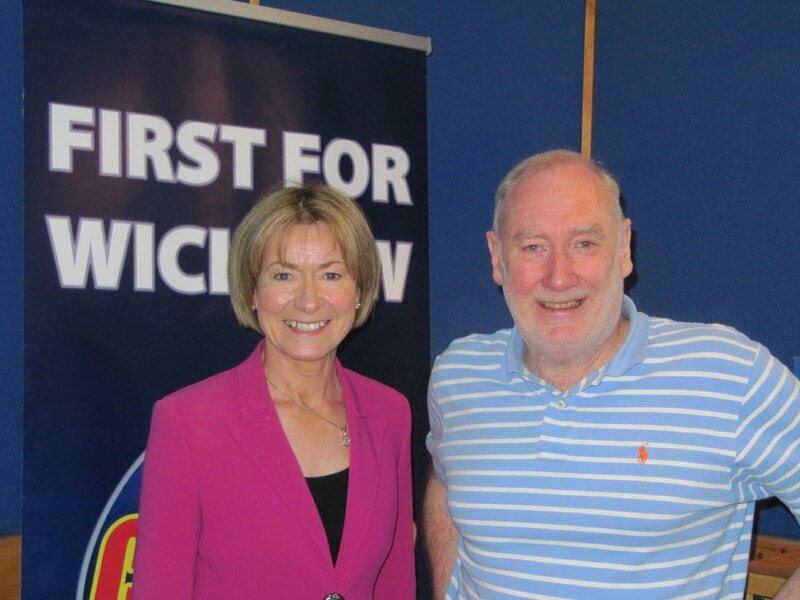 The Friday panel this week included Carol Tallon from First Time Buyers Guide, Cllr. Kieran O’Brien and Noel Keyes, Former Chairperson of the Wicklow Heritage Forum. Bob Montgomery Irish Times Columist, Motoring Historian and Enthusiast, on Ireland’s most classic riving routes. Les Culliton, told Declan about the Olympic sport of trampolining. Stuart Clarke from Hot Press told us about Oxegen festival that’s taking place this weekend. Stuart Purcell, Fine Art Valuer went through some antiques, there cost and value. Conor Murphy of Bray Wanderers who has been picked to ply in the Ireland Under 19’s squad in the European Championships. Amanda Brunker came on the phone to tell us why she’ll be singing at oxegen this weekend. WANT TO TAKE PART IN EAST COAST FM'S CROSS BAR CHALLENGE? Bray wanderers take on Liverpool XI at the Carlisle Grounds on Monday the 18th June and you could be part of the half time show! By the way you will be a lot closer than these guys ;) Tune in to Freshly Squeezed for you're chance to win!! These lads (above) El Hombre Jokes, who are supporting Paddy Casey at the Bray Summerfest tomorrow at the Bandstand were on ‘The Morning Show’ today. Dave Hughes INMO talked to Declan about their proposal calling on ICTU to support a mortgage strike while Karl Deeter from the Irish Mortgage Brokers Association joined the debate. Conor Niland who played at Wimbledon this year talk about his time there and what’s coming up for him for the rest of the year. Joe Behan, former Independent TD for Wicklow talked to us about the vote in the Dail last night on government health policy. Sean Duke, Contributing Editor of Science Spin Magazine talked to us about the latest science news stories in the news. Brian White from Bray Chulann Historical Society told Declan about his trip to Monaco, where he presented the society's latest journal and while he was there he found a map of Wicklow from the 16th century. Siobhan Donnelly talked to Declan all about food. Our Golf reporter Walter Townsend gave us an update on the Scottish Open. Sergeant John Fitzpatrick, gave us the Garda update. El Hombre Jokes were in studio and they performed live. They will be supporting Paddy Casey this Friday at the Bray Summerfest. 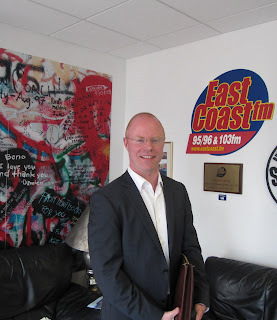 Freddie Millar, President of Arklow Chamber of Commerce told Declan about the VAT reduction. Peter Popham, Bespoke Cycles, Bray who is also part of the Bray Cycling Forum gave us an update on the forum’s work in Bray and Cllr. Derek Mitchell talked about cycling in Greystones and an update on Greystones Harbour. Stephen Donnelly Independent TD and Simon Harris Fine Gael TD on Loughlinstown A+E, SNA’s and Greystones Harbour. Ian Donnelly, President of Bray Chamber of Commerce and Dave Morrin, President of Greystones Chamber of Commerce talked to Declan about the VAT reduction implemented on the 1st of July. Peter McLoughlin told us about taking place in Belmount, Kilruddery Estate this Sunday. Cllr. Tommy Cullen on the HSE regional meeting that took place last night and his views on the Loughlinstown A+E situation. Morning Show reporter Laura Wood told us about Oxegen this weekend. Health and Fitness expert Helen Walsh talked to Declan about how to keep your tummy flat. Cllr. David Grant and Cllr. Tracy O’Brien talked about the flood pretection works on the Dargle River in Bray. •Dr Roisin Healy, National Childrens Hopsital Alliance gave her reaction to the latest news on the site for the childrens hopsital. •IKA CEO, Mark Murphy and Arklow liver transplant recipient Philip Kavanagh gave us their thoughts on transport for transplant after Maeve Mc Givern missed out on her liver transplant at the weekend. •Bagatelle’s Ken Doyle dropped in to talk about the bands gig for President Mary and Dr Martin Mc Aleese. •Parenting Coach Marian Byrne gave us tips on keeping the kids occupied over the summer months. 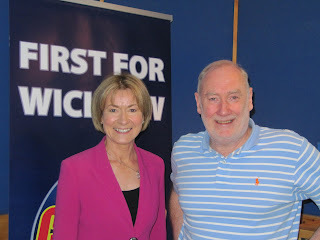 Presidential hopeful, Mary Davis was in studio this morning with Declan Meehan. •Blogger Barbara Scully, Money Doctor John Lowe and Former TD Joe Behan joined us to talk about the topics of the weekend and the day. •Professor Donal O’ Shea, Consultant Endocrinologist and Director of the weight management Clinic at St Columcille's Hospital gave us his thoughts on the potential closure of A&E there. •Clinical Psychologist, David Coleman spoke to us about bullying in Ireland and how to deal with it.